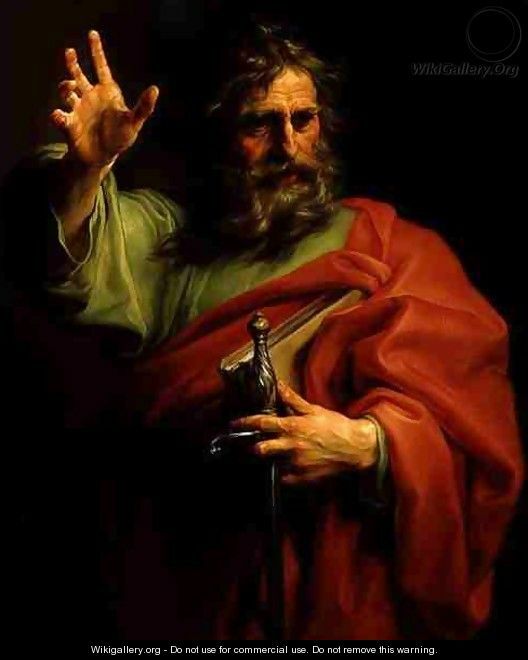 Saint Paul had a hard time. Last month we looked at how Paul was spreading the gospel to the pagans. When he arrived in a place he always spoke to the Jews in the Temple before talking to the pagans. This always caused problems. Some would listen to him and be converted while most opposed what he said and threatened him with violence. Some people listened and thought about what he said while others were angered at him for attempting to bring about a change in their ways. We see a good example of this opposition when Paul reached Ephesus on his way back to Jerusalem. In Ephesus there was a thriving trade in silver shrines of the goddess Diana. A silversmith called Demetrius called a meeting of his employees and other silversmiths and warned them against Paul. He told the meeting that Paul’s teaching discredited Diana, threatening to render her unimportant and, more importantly, destroying the trade that made them their fortunes. He whipped the crowd into a fury and the meeting ended in uproar. It seems obvious to us that these men objected to Paul for reasons that had nothing to do with religion. We would never behave like that, or would we? We too can be resistant to change for reasons that are not based in the Gospel. Often people resist change in the Church because they are happy to be where they are and see no reason to change something they have always believed to be good. I remember debating with my grandfather who saw no reason to have the Mass in the vernacular. He argued that the Latin Mass allowed you to go to Mass anywhere in the world and it would always be the same. I argued that it allowed you to go anywhere in the world and still not understand what was being said. When Paul eventually arrived in Jerusalem he went to the Temple to be purified. His seven days of purification were nearly over when some of the Jews from Asia recognized him and stirred up the crowd against him. The crowd seized Paul and a riot ensued. The Roman tribune heard there was a riot and sent soldiers to quell the riot. He arrested Paul and took him in chains to the fortress. Paul asked permission to address the crowd and explain who he was and how he had come to be a believer in Jesus. When they heard his story the Jews demanded he be killed. The tribune ordered Paul to be questioned under the lash. As they strapped him down Paul asked if it was legal to flog a Roman citizen without a trial first. Realizing what he had done the tribune released Paul. The next day Paul was brought before the Sanhedrin to state his case. He realized that the Sanhedrin was made up of Pharisees like himself and Sadducees. Paul claimed that the Sadducees opposed him for preaching resurrection which the Pharisees believed in but the Sadducees did not. This split the meeting and feelings were running high. The tribune, afraid the Paul would be harmed sent troops in to bring to the fortress. The Jews plotted to kill Paul but the tribune learned of the plot. He sent Paul under guard to Caesarea to be examined by the Governor, Felix. Felix listened to both sides but did not come to a decision. He kept Paul for two years until he was replaced by a new governor, Porcius Festus. Festus listened to the complaints against Paul and asked if he was willing to go to Jerusalem to be tried there. Paul asserted his right, as a Roman citizen, to be tried by Caesar. Festus had little choice but to send Paul to Rome. The journey to Rome was no simple affair. The best route was by ship. These ships were not the large liners we might sail across the Mediterranean in. They were small and did not make the journey in one go. Paul had to sail from one port to another, each time finding another ship to take him nearer to Rome. On the third leg of this journey the ship was struck by a violent storm and was forced to drift before the wind. As the storm raged on the next day the crew were forced to jettison the cargo and on the third day they had to throw the boat’s gear overboard. The ship was caught in the storm for fourteen days and they had been unable to take any food. Paul reassured them that God had promised they would all survive as Paul was destined to go before Caesar. They all ate some food and at daybreak the found themselves at Malta where the ship ran aground. The soldiers determined to kill Paul and his companions to stop them escaping but the centurion stopped them as he was determined to deliver Paul to Rome. It was three months before better weather allowed them to continue their journey to Rome. Paul made contact with the Jews in Rome and continued to spread the Gospel message. Paul remained there for two years. As we can see from his story, Paul faced trials in court and the dangers involved in travelling on long journeys in those early times. He faced both sorts of trials in the same way. He placed all his trust in God. God had chosen him to complete a mission and Paul knew that he would survive until his mission was completed. He was proved to be correct. Now we might think it was ok for Paul who had heard God speak directly to him and had appeared to him. God is unlikely to appear to any of us with a message of reassurance. How can we hope to behave like Paul with such confidence? This is really because we do not understand God and how he deals with us. Each of us has a mission; it may not be as dramatic as Paul’s but it is why we are here. We find it difficult to recognise the important mission we have and distinguish it from the normal problems of everyday life. We worry about trivia and get dispirited when our plans don’t seem to work out. My plan to win the Euromillions and sort out poverty in Africa has come to nothing. I wonder why God doesn’t help out. The reason is that it is my plan, not God’s. It’s not my place to sort out world poverty single handed. That’s not in God’s plan. I remember speaking to some primary school pupils about the work of Holy Childhood. One wee boy asked me what we would do when we sorted out all the poverty and there were no poor people any more. I can’t remember the daft answer I must have given him but he made me think. What would we do? How would we be able to live out our Christian calling to feed the hungry cloth the naked and help the sick if there were no poor? They are our road to salvation in God’s plan. Paul was a great orator and converted many people with his preaching. He converted many more by his example of curing the sick, acting justly and devoting his life for the benefit of others. Surely we could all do a bit of that. We don’t need to be orators. We can lead the world to God by our good example.